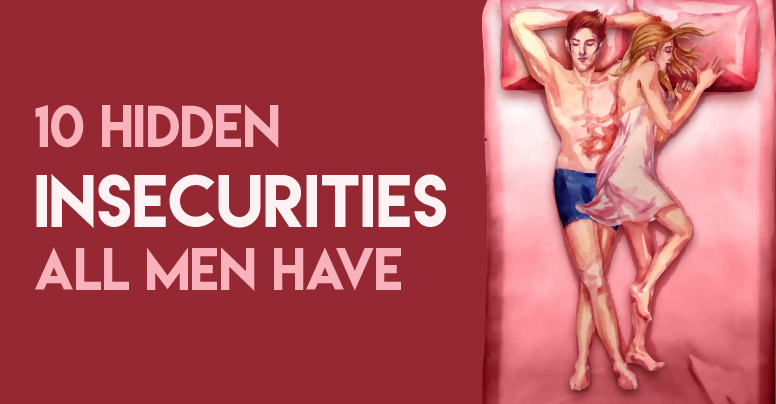 Men have the tendency to be more closed off than women due to their age old image being reinforced by society. The expectations that come with pertaining this image are something that have made these men the center point to a lot of pressure and their need to stand by these expectations have not so surprisingly generated a great feeling of unhappiness and insecurities in men, not allowing us to peak at any part that can challenge their status as the ‘man’ in the society. Another reason these insecurities have generated is because that men feel the need to compete for the alpha title and the quest to obtain their Luna or the female wolf. One of these expectations is remaining strong, which involves not showing their emotions to the world which in turn led us to make this list of insecurities men possess, why they possess them so women can understand their psyche better and let’s face it women are not going to find out from men directly by themselves. The age old image of the men is something we have already something we mentioned to you earlier. In order to understand this concept you need to identify this image under these particular headings to understand as to why it effects men the way it does. In this particular sub heading, men have always been known as humans who ‘provide’ for their family leading men to constantly remain under pressure about providing for their family and providing what is enough. Not to mention that the idea of the display of wealth directly quotes the idea of a man’s success also combines with this idea itself and generates more pressure on men thus making them insecure about their finances. Like girls are under this constant pressure to have a thin body, men are constantly under the pressure to have biceps, triceps, abs and collarbones to impress the world around them. To impress the women around them, to one up the men around them. Being raised to always try to be the alpha male, men often feel the need to have the most well defined abs than the next person, bigger biceps than the next person, sort of like every girl who wants a better bag to outshine the one her enemy or even friend possess. The caveman ideologies never end. Men believe their performance in the bedroom is something that gets them ‘respect’, ‘honor’, ‘integrity’ and even more women which in turn gets them more ‘respect.’ If a man is known as someone who can perform great in bed he automatically feels like he is the best thing out there. Not only does his self-esteem kick up a notch it makes him feel like he has just defended his championship belt. Assume what happens if a girl does not seem that satisfied with the guy after they do indulge in this, the guy won’t ask her outright but he is sure to feel insecure at her lack of response to his performance thus generating anxiety and paranoia, enabling him to perform even worse next time granted it was really his bad performance the first time that did not pursue her comments in the first place. Assuming every movie star that girl’s do go crazy over usually has a full head of hair men who don’t have a whole lot of hair and cannot feed on the privilege of being rich and thus getting the necessary hair transplant conditions to fulfil the criteria they think women want them to fill up often turns into a reason for insecurities. Men are constantly insecure about having a receding hairline or losing their hair completely fearing it makes them look unattractive, which in turn deteriorates their image in society in their own eyes. We have all heard the ever famous concept, ‘the bigger the manhood the more the alpha abilities that a man possesses which in turn means he is more superior than the other men’. This spitting contest adds up to generating another insecurity in men over something as futile as size. Men have the tendency to have insecurities that generate in them when they feel like their girlfriend or wife has the tendency to add more people to their lives in a way they would not particularly like. This shows the level of insecurity that mostly stems from jealously from men between one another. Always wanting to know they are enough for their respective wife and children is something every man wants to feel safe and secure about and when he is not it becomes an insecurity. Most men are brought up by the system of men not being allowed to cry or show any emotion society feels is unjustified unless it is anger. This concept not only displaces men from an axis that helps them swivel around the world but makes them bottle up so much pent up grief that exerts from them in the form of anger which can have terrible results for them and for others. Display of emotions makes them feel weak, an emotion they don’t like feeling. Their low self-esteem stems from a lot of different factors that add up and turn into a huge thing that is completely blown out of proportion. It could be about being shorter, poorer, chubby, less successful than their best friend that makes them feel like they have achieved nothing in life making them feel like people are questioning their credibility as a human, as a man and as a provider. This further crushes their zing when they don’t even appreciate what they have at the moment anyway. This brings us back to the ever so famous debate yet again. Does size really matter? Having a bigger sexual organ or being taller than other guys or the girls is something men need in order to feel validation from society. If a man is shorter he feels like this cuts his options and limits it to certain women he might not even like. Their options and their respect is cut down according to the limitations provided by their own height is something that makes men really insecure. Some men have been known to prefer giving the wrong piece of information rather than admitting they don’t know about that particular thing because they are afraid of falling into the stereotypes of men being less smarter than women. It is rather ironic that men work so hard to maintain every other stereotype that society has drawn out for them and struggle to fight the one it has not. Men feel insecure when they feel like their credibility is being challenged by others thus making them rather inadequate human beings something they feel like they have to constantly struggle to stay out of.